THIS IS A TIME OF SPIRITUAL BOOSTING AND NOT SPIRITUAL BOASTING. THIS IS A TIME TO GIVE UP SOME THINGS, TAKE UP SOME THINGS, LIFT UP SOME ONE and SHOW UP MORE REGULARLY. THIS IS A TIME OF SPIRITUAL BOOSTING AND NOT SPIRITUAL BOASTING. 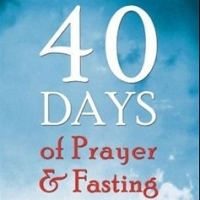 We want to have a spiritual boost in our Christian walk by denying the flesh daily, taking up the cross, feeding our faith and following Christ.Join us as we receive the Anointing of the Holy Oil and the Holy Communion for our 40 Days of Prayer & Fasting during the season of Lent. We fast Monday-Saturday till Easter Sunday. At 7pm, Wednesday, February 14th we will receive the blessed oil and communion and each week afterwards Communion Served 7pm Wednesday till Easter Sunday on April 1st in preparation of the celebration of the resurrection of Jesus Christ. During lent we are mindful to REPENT of ourj sins and to seek forgiveness. We REFLECT on the condition of our spiritual relationship and our walk with Christ as we aspire to be in the world, but not of the world. We REPLENTISH our inner spirit by denying our flesh and feeding our spirit intentionally, regularly, faithfully and prayerfully. 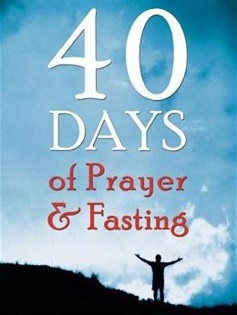 We RENEW our faith and faithfulness to following Christ and the Word of God by devoting ourselves to the spiritual discipline of fasting and praying. THIS IS A TIME TO GIVE UP, TAKE UP, HELP UP and SHOW UP. GIVE UP: 1. The ungodly (Give up the people, places, things, acts or deeds that do not honor God or goes against God.) in honor of Christ and in reverence to God. 2. The strongholds (Give up the favorite food, drinks, activities, tv shows, social media, places that have a strong pull or craving on the feeding of the flesh which may or may not be sinful.) to take and demonstrate spiritual authority over the flesh. 3. The creature comforts and conveniences that we enjoy (Give up elevators, escalators, etc.) to symbolically join the suffering of Christ. TAKE UP 2. The godly (the Christian acts, deeds, worship services, bible studies, Church School Classes, etc.) to feed and empower our spirit and to activate the power of the Holy Spirit within us. LIFT UP 3. Your Neighbors. (Lift up and Help up another person, group of people, a ministry, the church, etc. by serving them, supporting them, encouraging them, assisting them in some way as unto the Lord Himself. DURING OUR 40-DAY FASTING & PRAYING PERIOD AND AS AN AMBASSADOR OF CHRIST, LET US BE FOUND BEING EXTRA: extra kind, extra helpful, extra generous, extra loving, extra gracious, extra merciful, extra patient, extra committed, extra faithful, extra dependable, etc. as a representative of Christ. SHOW UP 4. For Christ (Make a commitment to show up for Christ in church for the next forty days. Be committed to attending every Bible Study, every weekly Communion, every Sunday Church School weekly class and every Sunday Worship Services during the Lent and watch God move mightily with faith, power, favor and protection.